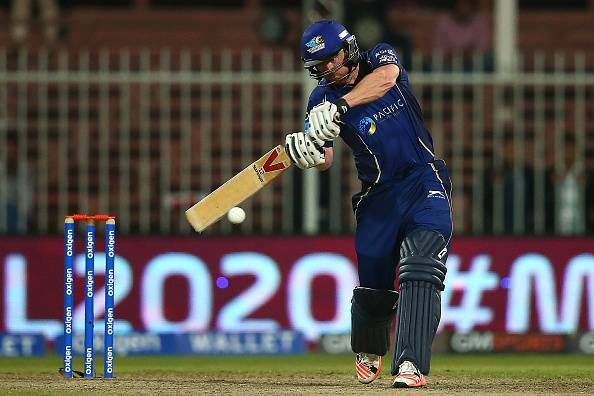 Unbeaten half-centuries from captain Paul Collingwood and opener Andrew Symonds helped Capricorn Commanders comprehensively beat Libra Legends by 8 wickets and 22 balls to spare. Legends failed to capitalise on a good start and only made 154/7, which was never going to be enough on a flat track and so it proved. After winning the toss for the first time, Kallis had no hesitation in batting. It proved to be the right call as both he and Lumb got the Legends off to a good start. They ended the powerplay on 55/0, their best of the tournament so far. But both openers weren’t done yet as Michael Lumb got to his fifty off 33 balls just before the strategic time-out. At 88/0 at the halfway stage, it looked as though the Legends were looking at a score close to 200. But the time-out proved to be the game-changer as the first legal delivery after the time-out resulted in a wicket. Lumb picked out the man in the deep perfectly and the Legends lost their first wicket for 89. After getting to their 100, Sean Ervine, who edged twice for four through slip, finally ran out of luck and was stumped. From there onwards, Commanders' spin trio of Jeetan Patel, Upul Chandana and Sunil Joshi took over and completely ran the show. The trio bowled 11 overs between them and took five wickets for just 83 runs as they suffocated the Legends and took away all the momentum from their innings. Legends would have been disappointed with the way they finished their innings as they failed to capitalise on a good start. After racing to 89/0 in 10 overs, they managed just 54 runs off the last 52 balls, during which time they also lost six wickets. Although both openers, Lumb and Kallis, got their fifties the momentum was well and truly with the Commanders who had managed to restrict them to 154. In reply, Commanders got off to a tentative start as both Ashwell Prince and Andrew Symonds looked more keen on seeing off the new ball rather than taking too many risks. But out of nowhere, Prince broke the shackles with two sixes but he failed ot pick an Ervine slower ball and perished. Rizwan Cheema, who looked hit a four and a six off his first four balls, then perished trying an ugly heave off Ryan ten Doeschate’s first ball. That brought the Commanders skipper to the crease and he and Symonds put together an unbeaten 110-run third-wicket partnership off just 70 balls to see the Commanders home. At first, the pair looked content to just work singles and get there in the final over but Collingwood, who was going at run-a-ball until then, suddenly unleashed his wrath on his former teammate Graeme Swann in the 12th over and that proved to be the catalyst. From then onwards, the pair wanted to get to the target in a hurry and first Collingwood brought up his fifty with back-to-back sixes and then Symonds follow suit. In the end, the margin of victory, both in terms of balls and wickets just highlights the gulf in performance between the two sides.